Limited Clear blue tint shell, Chrome cassette. Hip hop legend Cormega's back with his first new album since 2009's ''Born And Raised.'' 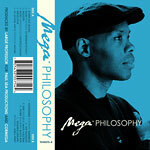 ''Mega Philosophy'' is exactly what it says in the title: a summing up of 'Mega's point of view. With tracks that feature Raekwon, Chantelle Nandi, Maya Azucena, and other heavyweights, Mega Philosophy brings it all together. The album includes The first track from the supergroup M.A.R.S. made up of Action Bronson, Cormega, Saigon and Roc Marciano! We all appreciate the dope boom bap production of Large Pro and some of the best lyrics from Mega! This is some wise, philosophical hip hop that we all need to honor! ''The Industry'' is a crazy hip hop classic! The beat and raps come so correct it is heavenly! It is the type of joint that is perfect for summer time or any time really! Love it!